I have a lot of pictures today!! It's the combination of snow and ice that makes things more difficult. When the city advisories said "STAY OFF THE ROADS", I don't think they meant driving off of them. 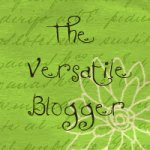 This week, here at TAOBC, I am aiming for a few heart warming stories resulting from events around Kansas City. Anything that has the word "warm" connected to it, got moved to the front of the line. So for today, I am just talking about some nice things that have happened in my city this past week. Hopefully, there are nice things happening where you live as well. Last week, I wrote about the first wave of the snowstorm that blew through here on Thursday. 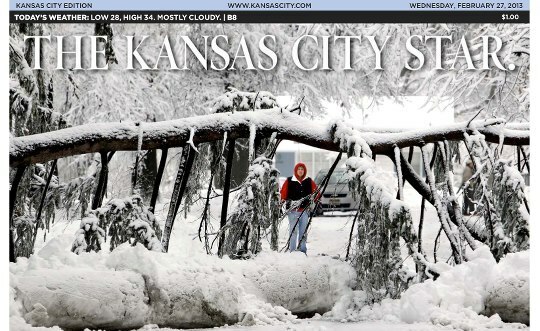 With that storm most of the KC got between 10-16 inches of snow. Comparatively speaking that amount of snow isn't all that bad. I guess, you might disagree if you live in Phoenix or Orlando. Here in Kansas City that amount isn't unheard of but is a bit unusual. The upside to the snow...is that it is a lot of fun for the kids (the word "kid" here isn't defined by age) that came out in droves to play. I was going to post a picture of all the people on one of the local sledding hills. but after arriving, I couldn't find a parking spot. The hill was covered with all manner of people with sleds, toboggans, even sheets of plastic to slide around on this wintery slide. SPOILER ALERT!!! 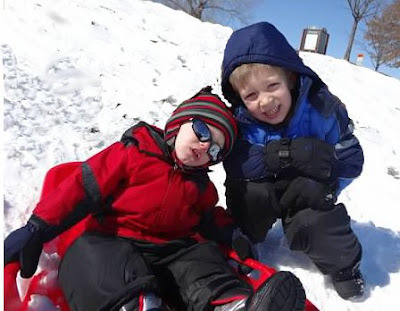 Just so you get to see some sledding pictures, I have added some to the bottom of the post. ANYWHO... as I was saying.........That was last Thursday......and the snow wasn't done with us. After a couple of days of milder weather, round two came through. Tuesday of this week a second snow storm moved into the area clogging up the already snow packed roads. That brings me to a story that is a story about people being generous and kind. Really?? LOOK AT ME WRITING A FRIDAY NEWS STORY THAT IS ABOUT NICE PEOPLE. Emergency crews were called to a south side Kansas City neighborhood on Tuesday where a resident had collapsed of an apparent heart attack while trying to shovel out the snow from his drive. Unfortunately, when the ambulance tried to enter the unplowed street, it became stuck. Now that is what you call GOOD NEIGHBORS. John Molloy said he and his neighbor were both out in their yards building snow forts with their children when they saw the stuck ambulance. The vehicle's rear wheels were just spinning in the snow. The two men grabbed shovels and headed down the street to try to dig out the back tires of the ambulance. Other neighbors noticed as well. One by one people started coming out of the houses all along the street..with their shovels. 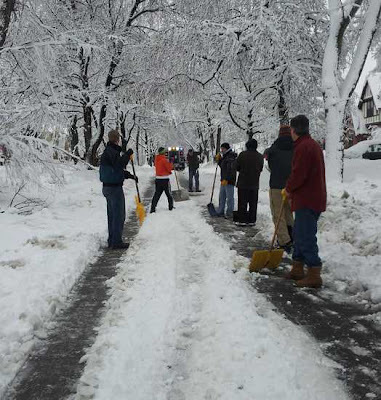 Each person shoveling a portion of the street allowing the ambulance to reach the collapsed neighbor. As the ambulance arrived the fallen man was unresponsive with no pulse. As the neighbors waited the paramedics attempted to resuscitate the man who was loaded into an ambulance. The ill man was revived on the way to the hospital and is said to be doing well. Later a statement was issued by Battalion Chief James Garrett. "Truly those neighbors helped save his life. It's a great story of people helping people." That is just downright neighborly. Doesn't human kindness just warm your heart. Now I have probably confused you because I was talking about "feel good" stories. Yes, I still am heading toward a nice story. 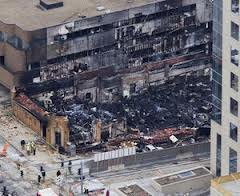 On February 19th a construction crew hit a gas leak causing a massive explosion leveling JJ's, a local restaurant that has been part of the Country Club Plaza for 28 years. Again...not the nice part. Here is the part that is the nice part. The community has pulled together to help the JJs employees sustain themselves until their restaurant is rebuilt or whatever is to be decided about the future of the destroyed restaurant. One of the other local restaurants, Jaspers, got the ball rolling by all of their staff giving up shifts so that the JJs employees could keep working. Then other restaurants followed. A number of restaurants are absorbing the displaced workers. Also, there are over 100 other restaurants that are donating 10 percent of their profits to help fund the JJs Employee Assistance Fund. Still others are putting together fundraisers to cover the needs of the 15 that were injured and help the family of the one fatality. The fund will cover living expenses, medical insurance and other costs associated with the staff's needs during the process of rebuilding. According to a press release, all the displaced employees will continue to draw paychecks. I love when a community helps their own in times of need. I am a big supporter of the local zoo. Yep, I LOVE the Kansas City Zoo. As as a card carrying member of the "Friends of the KC Zoo", I am thinking our new Polar Bear is quite cute. So today, I would like to introduce you to Berlin. 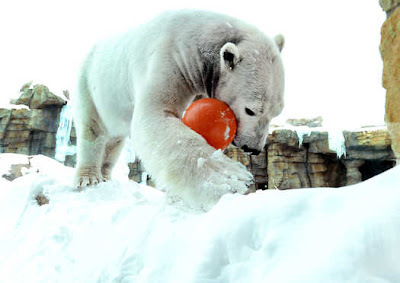 She has come to keep Nikita the male Polar bear at the KC Zoo company. Berlin is relaxing in the sun prior to the snow starting. Right now, Nikita is protecting his balls. If Berlin handles herself right, she will get them. I think the zoo is hoping that Berlin the Polar Bear is a cougar. (she is older than Nikita) It would be a nice addition to the zoo to have some baby bears. While I try to contain myself, and not post a ton of pictures of my grandboys...because people tend to get annoyed with too much of that sort of thing. I just can't resist a couple of these. Big brother is holding on tight to little brother. I'm two and I'm cool which makes big brother laugh. 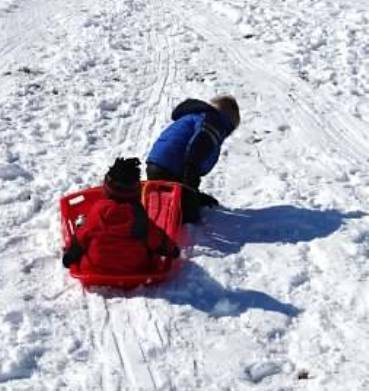 Pulling someone up the hill is waaayyy harder than sliding down the hill. You can thank me that I didn't post 50 more. You're welcome! "Really?? LOOK AT ME WRITING A FRIDAY NEWS STORY THAT IS ABOUT NICE PEOPLE. " That made me laugh SOOOOOO hard, I literally choked!! "That is just downright neighborly. Doesn't human kindness just warm your heart." Omg. Yes. That was an awesome story! I could totally picture all of the people shoveling out the ambulance which luckily saved that guys life! "A number of restaurants are absorbing the displaced workers" - Awwwwwww! "The fund will cover living expenses, medical insurance and other costs associated with the staff's needs during the process of rebuilding." Now THAT is awesomeness. Berlin is ridiculously adorable as are your sledding photos! Heart-warming, each and every item! Great pictures. I can't get enough pics of children playing. But they do make me look forward to warmer weather. No choking allowed!!! I have a very low guilt threshhold. I agree, isn't that the most awesome neighborhood that they would all run out and start shoveling. I have always said that most suburban neighbors would step over a body on the sidewalk before they would stop to check it out. I love that the Plaza restaurants are coming together. As most of these jobs rely on tips not on paychecks, they need to either work or take advantage of the fund. Especially in high end restaurants, their tips would have been paying them a really good wage. That picture of Berlin...what a cutie....and yes, I think the G-boys are awesome sauce. Glad you found them heat warming as well. It's been a funky week here and it was nice to see some feel good stories. I am ready for a thaw for sure. Sunday we are supposed to be in the 40's which will feel really nice. It IS Friday . Isn't it? I checked and rechecked. How can i survive my weekend without pondering the weird foolishness of humanity? I count on you, Cheryl. Are you sure that snow didn't freeze your brain> Oh, I know, you've had to switch to survivalist mode, making nicey-nicey . Who knows what March holds for you. .. It felt odd at this end not looking through all the routine sources to find out what idiot did what idiotic thing this week. But you are right. Yesterday, I just wasn't in the mood to look around at how the more creative among us thought they could gain wealth and glory. I totally agree with you about "isn't it a shame that we don't support each other every day". I recently had a bit of a minor tiff with a friend about this very subject. I said that I find people are very giving about helping in crisis but the rudeness in the everyday kind of interaction has all but vanished. She said that people are kinder than EVER. I guess Crabby Pants is NEVER in the corner...she is glued to me. As far as next Friday. I will go back to my nasty judgmental ways pointing fingers at those "did they really do that???" types because I actually am amazed at what people are capable of doing. In my next life, I would love to be a judge. They must have some interesting stories to tell. I realized after I hit the send ...I meant kindness has disappeared...not rudeness. Rudeness is alive and well. 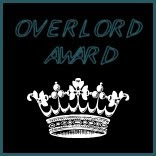 I made the edit but I don't know if that shows up at your end. PS I'm at Life by Chocolate, www.rawknrobyn.blogspot.com. Have a great weekend. Thank you Robyn....I am so glad you some of this made you smile. . I will admit that my g-boys make me smile big time. You have a great weekend as well. 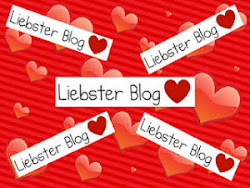 BTW...love your blog. You know...from one grandparent to another...I think that my "G" boys are about as cute and yours.....in fact....I think my grand-boys look a lot like yours......could it be???? And sunglasses are always TOO COOL FOR SCHOOL....and can't wait to go to the local zoo and check on the polar bears....nothing better than to have your mate in the same enclosure...bet Nikita and Berlin are HAPPY with all that snow....they rate number two on the cuteness scale....right behind your grandsons.....hey, stay off the roads....fun. Yes, they are adorable and they love their grandpa. G-boy #2 does totally rock those glasses, don't you think? But then G-boy #1 is such a doll to pull his baby brother around. The two year-old has the cool shades. Wonderful stories. I really like the shoveling to save the neighbor. We get the nice story once in awhile here too. This past month a motorist pulled off the road to save a woman who was being attacked and then with the help of others persuaded the attacker and held him until police arrived. Sweet! Thank you for the good news. I actually love reading stuff like this. I love stuff like this, and I absolutely ADORE the first 2 stories! Helps to bring back a spark of faith in humanity! Isn't it nice to hear or read stories that extoll the kindness of people instead of constantly being barraged with people doing harm to other people. Gives you hope for humanity when you hear stories like the one you were just talking about. She is pretty darn cute. There is a web cam set up in Nikita and Berlins home. They have a huge tank (140,000 gallons) and separate bedrooms and play area. I was watching them play a little yesterday on the webcam. Really cute. 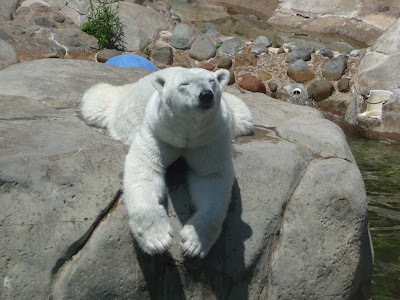 If you ever feel the need to watch polar bears go to the Kansas City Zoo web site and there is a link for the webcam. Glad you enjoyed it. Yes, sometimes one just has to refuel on the good stuff to keep from slamming ones head against a wall. Give it a day or two, Jewells. Yep, in a day or so, you will be back to losing all hope. I do agree, whole heartedly. Grandkids are adorable!!!! You can send your snow my way if you'd like. I spent my high school years in New Hampshire. 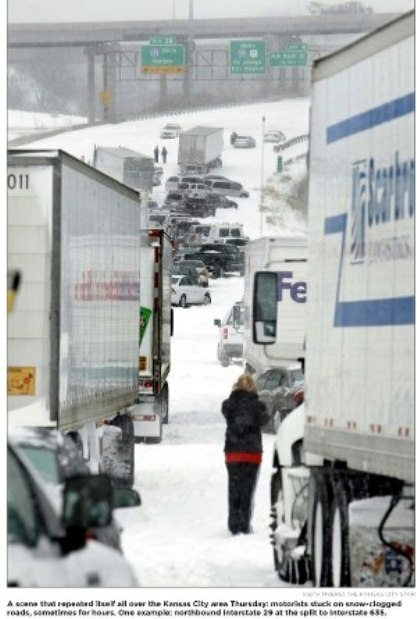 Now that I live in North Carolina, I find myself missing those snow storms. Oh sure, we had threats of snowhere a few days ago. We actually had a few flakes hit the ground. Butonce the police came and stopped those guys from jumped off their roofs, we just sat in cold, looking at the fat, gray clouds, and wished for a wintery reason not to go to work. 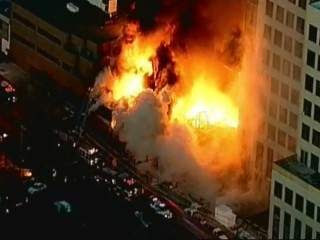 I hope no one was hurt by the explosion at JJ's. 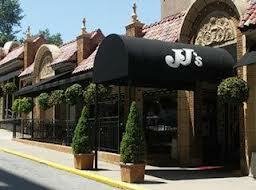 Of course, I can see the next day's write up by a food critic: "Went to JJ's last night. Had a blast. The steak was a little over cooked. Could have done without the flash mob." It pains me to say this, but I'll forego the polar bear puns ... this time. Great pics of your grandchildren. 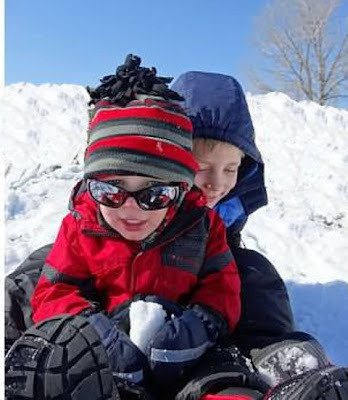 The only thing better than your kids playing in the snow is the afterwards - being in a warm home with them, sharing tasty hot cocoa full of those little marshmallows. There's no joking with those fond memories. For some reason, Diqus is making it difficult to post my above comment. Hi Anon A Mus, I got your comment on my dashboard fine but you must of had trouble signing onto Disqus. There is something going on with Disqus as of late. Several blogs that I have been following won't let me sign onto Disqus in Internet Explorer but let's me sign in on Chrome. Some glitch seems to be messing with comments. You wouldn't want this much snow. It pasted pretty at about 8 or 9 inches. I think it hit 22 inches of heavy wet snow before it quit. North Carolina sound really nice...it always sounds nice but especially now. Yes, some people were hurt (15 were taken to the hospital) and one death. AND while that is horrible the fact that a blast like that didn't kill a lot more is a miracle. It was before the supper crowd in the middle of the week which helped. But you are right about the write up a food critic could do given the circumstances. No puns??? I guess I will just grin and bear it. I love the age of these little guys. It goes by fast. 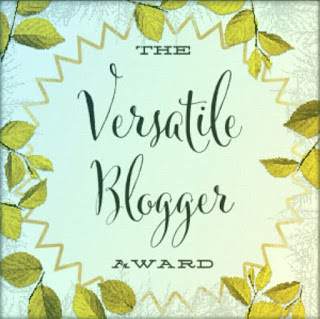 Oh, I hope you got the response to your comments.If you didn't get an email they are on my blog. I'm not exactly sure how responses work if you sign in as a guest. Be assured I always love your witty responses and hate that you had trouble with the comment section. Cheryl, those really are stories of the "warm and fuzzy" variety. Lovely! It's nice to know that there's still some good in people. Very nice to hear about people helping people, amazing, almost unbelievable, LOL...and your grandchildren are adorable!..Grandkids are the best! I agree...every once in a while I have to just read "feel good" news or I will combust from all my negativity. Ditto..Grandkids are the best. If a person has to get old and their body has to look like age trampled over them......at least there is a reward by having wonderfully adorable grandkids. We need a lot more of this, people helping each other in times of need. Especially when you see CCTV footage on the news of people getting beaten or robbed or stabbed and there's always a mob of people around just watching instead of doing something. I agree. Last week I was sick to death (no pun intended) of hearing about all the shitheads of the world hurting each other and decided I needed to concentrate on some feel-good stuff. I am sure by next Friday, I will be back to my pathetic jaded self. there is more goodness in the world than evil...i know it. love the pictures of those beautiful grandsons! I believe it that is true as well. Thanks...little kids at play are always cute aren't they?